If you’re like me then you like free money. Seriously, who doesn’t like free money! 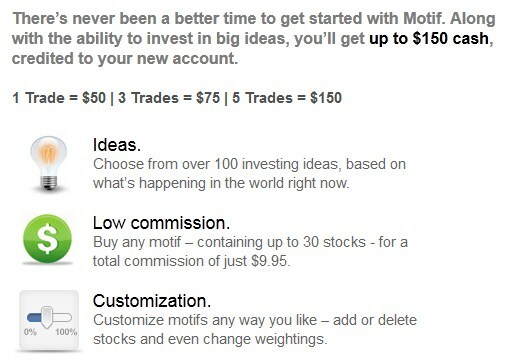 So when I heard Motif was offering $150 to open an account, that got my attention. I tend to shy away from Mutual funds or ETF’s because of management fees. The great thing about Motif is that you can buy up to 30 individual stocks at once for just $9.95! Yes, 30 individual stocks. You are creating your own ETF without the fees. Motif is a discount brokerage company that lets you invest based on themes. You can build your own or use an already made motif – that is a basket of stocks. 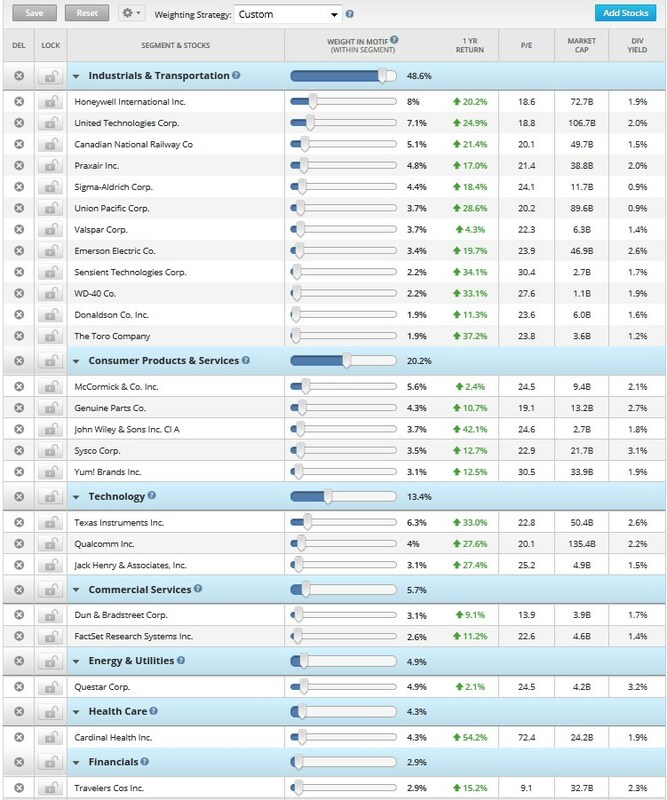 You can have up to 30 individual stocks or ETF’s in each Motif. There’s a lot of motifs already created with many themes. Once you log in and select Explore Motif’s, you are presented with several options. If you don’t like any existing, then you can create your own completely custom motif. There’s a Motif for almost anything you can think of. Would you like to invest in Chinese Solar or a hot Rental Market, there’s one for that! For this example I’ve selected Dividends under the heading, Investing Classics. Once you pick a theme, you can choose different motifs. 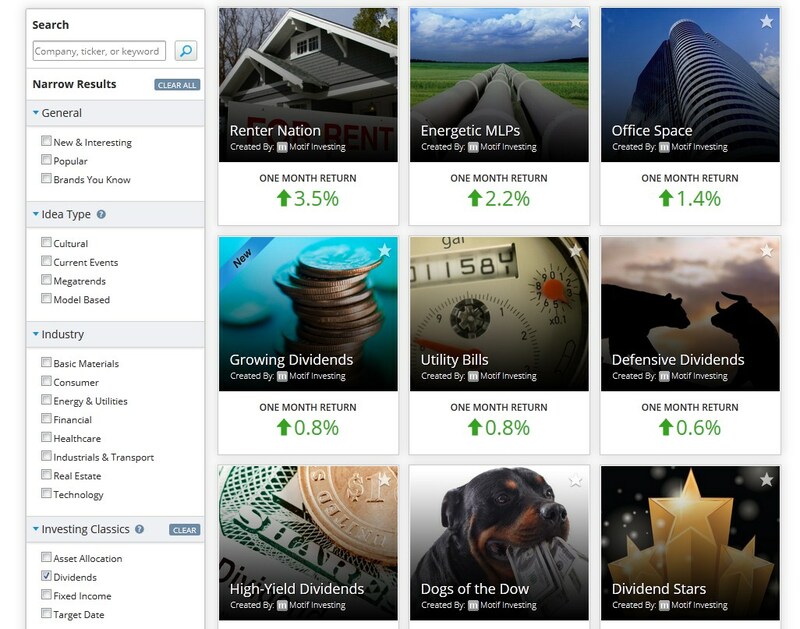 I clicked on a new one called Growing Dividends. What’s really cool is that I can add/delete any individual stock that I want and I can also move any of these sliders to pick a different weight. Once you are done customizing, you can purchase your motif. Another cool feature is that you can join the Creator Royalty Program and select the option to add your motifs to the program. 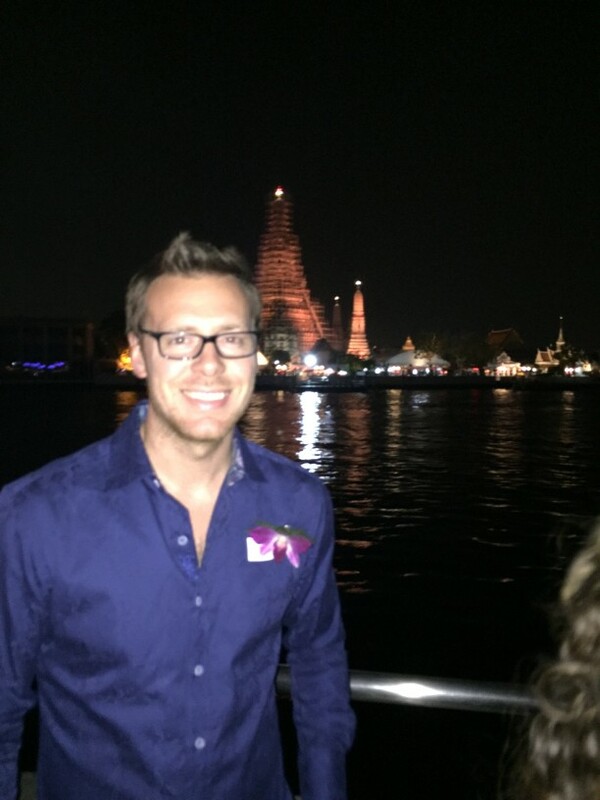 When another investors purchases your motif then you are eligible for compensation based on a royalty system. Pricing – You can purchase 30 stocks at once for only $9.95. Most brokerages charge at least $5 for each individual stock. Customization – if you don’t like a stock in a particular motif, you can switch it out with a different one. You can also change the weight of that particular position with ease or create your own custom motif. Investing Social Network – You can interact and see comments or feedback from other people buying these motif’s. You can invite friends from Facebook or meet other people with like investing ideas. Multiple Account Options – You can create an individual, joint, Traditional IRA, Roth IRA or Trust Account for estate planning. Research – Motif is a discount firm and doesn’t have a lot of research tools. This offer isn’t valid for retirement accounts such as IRAs. Currently Motif Investing does not have an expiration date for this offer. If you’re interested in signing up, please follow the banner at the top or bottom of the page. I wouldn’t be promoting this product if it wasn’t something I wasn’t going to use. I’ll be sure and share my first purchase once my account has been fully funded. Is anyone else already using Motif? Wow I really like the concept. I really like the creator royalty program idea. Essentially you are creating your own ETF without MERS. Looks like a great way to organize and diversify your portfolio. The slider idea is a nice concept for weight adjusting. My only concern with that come tax time you will have a hard time if you tinker too much with weights every month and then have to deal with capital gains,losses. Overall it is a great concept that will surely attract copycats and its a step in a new direction. Yeah, the concept seems really cool. I’ll be sure and post when I make my first purchase. I’m not too concerned about taxes because I’m targeting companies that I don’t plan on selling anytime soon. Capital gains/losses are on realized in the year you sell. Even if I did, the brokerage account would keep up with your cost basis for you. I could be wrong but I don’t think changing the weights would make it too difficult. Yeah and I still have more to learn about it. It does seem like a great way to diversify quickly with little money invested. Yes, that’s what I thought. So far I like it but have only made two purchases. I’ll be sure and post updates on what is going on with my account. Let me know how that first purchase went. That definitely sounds like something I’d be interested in. Pretty good way to DCA into companies on a regular basis and get broad diversification. My only question is what happens if say on of the companies you bought all of a sudden starts sinking fast and you’re pretty sure hard times lie ahead, do you have to sell the whole “Motif” or can you sell just that one company/position. Granted I don’t expect that from the companies I own, but you never know. I’ll post about the trade soon and I’m still sort of a newbie. The way I read the details were that you could sell any one position from a Motif for just $5. That’s still really cheap for a trade. The only problem I see is that if you are spread out into so many companies then no one company would be a large part of your portfolio and it could get expensive to sell a lot of positions at once. For me though, I’m sticking to mostly companies I don’t plan on selling and I plan on adding to in order to get a larger position in. I know this post is a few months old but I am new to the site. Great stuff. Thanks for sharing your journey. Have you rebalanced your account since you started it? Is it difficult to track the cost basis? have you run into any other issues tracking your investments compared to what you do with your normal brokerage account/portfolio? Any insight would be great. Thanks. No worries, I still see all comments on my blog. I’m glad you found my site and hope you stick around! I haven’t re-balanced my account yet. I wanted a larger position in T so I bought T outright by itself as my second purchase which put it overweight in my DOW 30 Motif. I then bought using the same weights for my third purchase. Once T is as large as I’d like, I’ll probably re-balance this portfolio. Apparently it costs $5 to re-balance your entire Motif but I just haven’t done that yet. As for tracking, I can still see my original cost basis and the main metrics that I need to from any other brokerage account; price, yield, p/e , weight, etc. The only drawback I’ve found is that you have to keep your same weights when adding to your Motif. It costs $5 to re-balance. Really, this isn’t that big of a deal though. The $5 purchase cost is cheap and I don’t plan on doing a lot of re-balancing. Can you drip, or will you be accumulating all dividends and waiting for added capital to lump together to invest? That’s a good question. Right now there is no way to drip with Motif. So I basically let the dividends collect and add that to fresh capital as you mention. Even in my other brokerage account where I can drip, I chose not to. I think it’s good at first but now that I have a decent amount of dividend income, I would rather selectively invest it in the best opportunity I can find at the time.